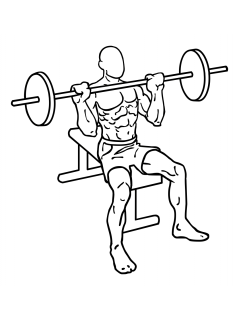 This exercise can also be performed standing up (Sit down for more support) Sit on the bench with your toes pointing straight out, back straight and abs drawn in. 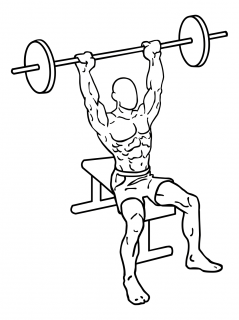 Grip the bar with your palms facing outwards and your hands shoulder width apart With bar in front of your head, press upwards extending your arms but not locking them. Pause at the top and then in a controlled movement lower the bar to the starting position.